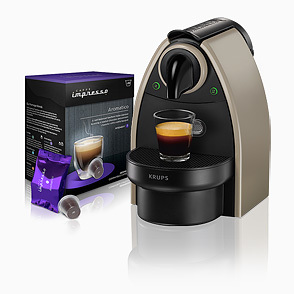 Will your coffee capsules work in my Nespresso® machine? Yes, our capsules are designed to work in your Nespresso® machine and for your piece of mind we offer a money back guarantee. How much do your capsules cost? Caffè Impresso capsules are priced at €0.30 each – 20% below Nespresso® retail price for their basic product. We believe this represents a great value over Nespresso® capsules, especially when you consider our coffee is actually higher quality! Do you offer some sort of guarantee against machine damages when customers use our capsules? There are myriad complaints and concerns about Nespresso machines breaking down for various reasons, most of which occur (statistically) while using Nespresso capsules. Our capsules are compatible with Nespresso machines, and therefore should not result in damage to any existing Nespresso machines currently on the market (as of June 2013). Capsule is loaded the wrong way – occasionally capsules drop through Nespresso’s horizontal extraction barrels. The capsule apertures on Pixie, Essenza and CitiZ machines are oversized, and in fact Nespresso capsules will drop straight through the machines as easily as any compatible. One must not be over-zealous in placing capsules into these machines. But some people push rather than drop the capsule in. Properly inserted capsules will stay in place. It’s simply a matter of perfecting one’s technique. The machine is old - These machines, like other small home appliances, are designed with a built in obsolescence of about 4 years. Age and wear and tear are more likely to blame for any damage than a capsule (whether Nespresso or compatible capsules), and in most instances, older or heavily used machines will break down no matter what capsules are used in them. Lever closure issues - Caffè Impresso capsules perform consistently well with all Nespresso machines. The Nespresso Essenza and CitiZ lever closure sometimes feel a little harder when closing on a Caffè Impresso or other compatible Capsules, which is purely to do with the gripping mechanism used to align the capsule inside the extraction aperture gripping plastic (which flexes and ‘gives’), rather than aluminium which indents. No damage will ever be caused by Caffè Impresso capsules to the piercing and injection mechanisms (3 pins) which cut through the aluminium of a Nespresso capsule before forcing water through it. This is because Caffè Impresso capsules are already perforated at the top, and thus designed so that the cutting part of the injection pins do not even touch our capsule. Caffè Impresso also recommends that users regularly de-scale their Nespresso machine (calcium build-up inside the machines is one of the biggest causes of machine failure and breakage) according to the manufacturers’ recommendations. And that users keep their machine clean with a warm soapy cloth, as well as properly powered down when not in use. Nespresso Machines and Nespresso capsules fit together like very loose jigsaw puzzle pieces. The pyramidal shape, and matching slot in Nespresso machines, along with the capsules’ extruded Aluminium construction, are patented by Nespresso. Most Nespresso-compatible polypropylene or plastic capsules are therefore made with a flat rather than pyramidal top. The practical result of this small design difference is that Nespresso-compatible capsules fit a Nespresso machine capsule slot to about 90% accuracy rather than 95% accuracy with Nespresso capsules (YES, Nespresso capsules drop through too ! ), which can occasionally create a tendency for misalignment as compatible capsules are dropped into the machine. This is EASILY overcome by paying a little attention to capsule insertion technique. Compatible capsule pushed into machine slot, drops straight through into capsule disposal container, where Nespresso capsule stays in place. Solution: Don’t push the Nespresso-Compatible capsule into place in the machine. Let it settle into place, otherwise it will drop straight through. Ensure capsule is aligned with compression head before closing the lever. If necessary, press the wide end of the capsule towards the front of the machine with your finger after you drop it in, before closing the lever, to ensure proper alignment as the lever is closed. Obviously, remove your finger before closing the lever ! Compatible capsule dropped into Nespresso capsule slot tilts down or sideways and thus becomes out of alignment with compression chamber, where Nespresso capsule stays aligned. Then when lever is being closed, it feels like its being forced to close. Solution: open lever again and reposition Nespresso-Compatible capsule. If necessary, press the wide end of the capsule towards the front of the machine with your finger after you drop it in, before closing the lever, to ensure proper alignment as the lever is closed. Close and lock lever and proceed as normal. Lever closure feels forced: Caffè Impresso makes its capsules of polypropylene rather than Aluminium, although the bottom foil of the compatible capsule is made of the same aluminium foil which is easily pierced by the Nespresso machine. However, capsules may feel different in the machine lever-closure action. When the lever on top of the Nespresso machine is pressed down you align with the extraction unit, at the same time as puncturing the bottom of the capsule ready for coffee extraction. With Caffè Impresso capsules, you don’t need to puncture the top of the capsule as precision perforations which maximise extraction flow through the coffee are already in the top of the capsule. So if the lever feels like its being forced with Nespresso-Compatible capsules, its not ! This is the difference between capsule alignment mechanisms grasping the plastic ‘hips’ of the capsule rather than soft aluminium. Solution: As long as you have your capsule properly aligned (see above), press the lever down until it locks. You will feel the pins ‘pop’ through the base foil as the capsule is simultaneously positioned correctly within the extraction unit. And proceed to make your Caffè Impresso™ espresso as normal ! Bear in mind, Nespresso compatible capsules will not damage a Nespresso machine just because they’re plastic. In any contest between the strength of steel vs. plastic, steel always wins ! Capsule doesn’t fit my NESPRESSO ROMEO machine very well. This is an old machine no longer sold by Nespresso. It was manufactured between 2004/2006, and in fact there have been myriad complaints about the machine breaking down: too many electrical problems and product jamming. It was a bit overcomplicated in its manufacture, hence its discontinuation. The capsule is loaded on the Romeo machine face down, coffee then extracted through the capsule vertically rather than the horizontal barrel configuration on Nespresso’s modern machines. This has the least potential of any Nespresso machine configuration for jamming. Any ROMEO machine would be between 6 and 8 years old as of this writing. These machines, like most small household appliances and ‘white goods’, are designed with a built in obsolescence of about 4 years. Old age and long term wear and tear are more likely to blame than any Nespresso compatible capsule, and in all likelihood the machine would have broken down using Nespresso capsules at about the same time. It would be entirely coincidental that a ROMEO machine would break down after 6+ years of use, when using a Nespresso-compatible capsule ! If the ROMEO problem is not a major breakdown, in most instances the machine can be shut down and turned back on again after a few minutes, so that it resets itself. The capsules will never fall straight through the Romeo machine because of the way the capsule is placed on the machine and then extracted vertically. How to better manage espresso coffee strength. You should restrict the pour volume (the amount of water flowing through your capsule during the extraction process) in order to get the optimum strength of coffee that each specially blended capsule is designed to deliver. Most Nespresso or Nespresso-compatible machines have a programmable pour volume setting (check manufacturers instructions for your machine to learn how to adjust pour volume settings) which may have been deliberately or inadvertently adjusted during use. This most often results in longer-pour programming for your machine rather than a shorter pour. Espresso capsules, just like commercial espresso machine porta-filters or ‘handles’ used by a professional barista, are designed to create the optimum individual espresso with between 5-7grams of finely ground coffee for each individual espresso. A text book single espresso should be just 1.25 fl.oz of liquid. If you prefer a double or ‘doppio’ espresso you should really use 2 capsules to pour a 2.5 fl.oz drink (just as a professional barista would use a double-shot of ground coffee in a double porta-filter) rather than to infuse twice as much water through one capsule, as this will only dilute and weaken your premium quality coffee taste. In fact the coffee connoisseurs’ choice is to order their espresso ‘ristretto’ (restricted) poured, at just 0.75 fl.oz to truly experience the finest and purest taste attributes and characteristics of each blend, and eliminate any of the bitterness that is experienced in coffee which is extracted for longer. Select the coffee blend that best suits your taste preference according to the strength or intensity rating on the package – Caffè Impresso blends range in intensity from 3 to 12 – and there’s a reason there is a choice: because everyone’s palate is different. Caffè Impresso will launch new espresso and coffee blends in coming years featuring additional character and strength choices. We aim to process and dispatch your order same day so usually you should receive your coffee capsules next day.